I would like to specifically mention the guides we had -- they were each unique and made our experiences very special -- Cesar in Lima, Raul in Arequipa, Sheyla in Cusco and Felix in Puno. Raul is a very impressive bird watcher and helped Joe identify many species of birds. We saw seven condors at Colca Canyon -- Raul knew just where to stand to get the best views of the birds. Sheyla made Machu Picchu, the Sacred Valley and Cusco magical places. Joe will never forget his 60th birthday at Machu Piccho -- we saw a double rainbow and an incredible sunset. 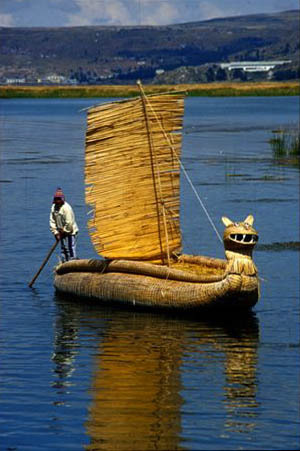 The boat cruise with Felix on Lake Titicaca was a perfect day. Kika in Lima was one of the most informed travel companions we have ever had. She made numerous changes to our itinerary as if she were reading our minds. The visit to the textile and cultural museums were highlights, as well as visits with contemporary and indigenous artists. About our guides. The lady in Lima was the best. Kika. Her English was excellent. She was very knowledgeable and enthusiastic. Alberto is such a personable man. He has such energy and great knowledge. We enjoyed his discussions of everything from culture to religion to the politics of bread. He maintained a great sense of humor throughout our visit. Our guide Alberto "Beto" Gomez was first class. He was extremely knowledgeable about the history of Peru. He reorganized the itinerary, which was a good idea, and we did everything on the agenda and more. We learned much of Peru and were both completely satisfied. I highly recommend him as a guide. We called Ofelia -- she meet us at the airport (well, well after midnight) and made arrangements for a driver to pick us up and take us back to the Miraflores Park Hotel. She was with us all the time!!! Never once did she feel this was an inconvenience. She only wanted to tend to our needs. She went above and beyond the call of duty. Ofelia was a superb guide! I was especially pleased to see her waiting right at the front of the crowd with my name in big letters when I arrived in Lima at 4:00 in the morning after a long flight! Ofelia also stood out for her attention to detail and her sensitivity to our moods and preferences. On our first day with her, at the Museo Larco, she noticed even before I did, that John was looking pale and ill. When he went to sit down, she kept an eye on him, and when he admitted to feeling like he really didn't want to go on, she swung into action, calling Manuel (the driver) to come and pick him up and take him back to the hotel, instructing Manuel to stop along the route and pick up some medicine. Ofelia and I went on through the extraordinary Larco Museum and enjoyed lunch on the patio, then we abandoned the rest of our schedule for that day so I could be back at the hotel to stay with John. This meant cancelling dinner at Astrid y Gaston, which was a disappointment. However, when we returned to Lima later in the tour, she and Inka's Empire Tours had somehow managed to re-schedule that dinner for the last night we were there, notwithstanding the difficulty in getting reservations at the premier restaurant in Lima. When the Miraflores charged us for my room service dinner the night John was ill, she went to bat and got us a refund. The Amaro Museum was a definite highlight -- thanks for putting that on the agenda. The guide for Lima -- Claudia Ruiz -- was also excellent. Juan Carlos had such depth of knowledge on every question we asked. We felt like three year olds -- "What's that bird? What's that building? Why is that the way it is? Who was that person, or that culture, or who made that pot, or that textile?" He answered everything with humour, patience, understanding and sensitivity for the subject matter. He never lectured us, but made us feel that we were part of an ongoing discussion. He respected such knowledge as we displayed and added to it. In fact, in Machu Picchu, I was stopped by another English speaking visitor who asked me, "Where did you get your guide -- he is fantastic!" We heartily agreed. In Peru, Eddie Pizzaro was willing to do anything I wanted to do and was very professional and helpful. He was very knowledgeable and could answer any question I might have. The Vistadome train ride back to Cuzco was slow. Eddie would point out significant places and historical artifacts along the way that not even locals knew about. We wanted to make special mention of our fantastic guide, Sheyla Robles. Sheyla had so much information, but beyond that took such good care of us. She truly is an Inca treasure. Sheyla made Machu Picchu, the Sacred Valley and Cusco magical places. Sheila was wonderful and she was very flexible and accomodating of our needs. Our son truly enjoyed that Sheila was willing to take him on a difficult hike in the early morning. The guides were very good -- we really liked Shelia in the Sacred Valley, Cuzco, and Machu Pichu. We over-tipped everyone, but especially Sheila. One thing we would both like to highlight is our guide in the Sacred Valley, MP and Cusco -- Sheila. We both thought she was terrific. Great knowledge, great personality and just nice to be around -- we enjoyed her company as much as we enjoyed the trip. As you are aware, Manuel is Inkan and we sat for hours learning and discussing the spiritual and cultural history of his civilization. We had those wonderful wow moments such as the shopping at the city market (not tourist market) and enjoying dinner at a local restaurant with Manuel and his absolutely delightful girlfriend. I believe we all could move to Cusco in about 3.2 seconds. Manuel, our outstandingly good guide, took particularly good care of us and was very sensitive to our needs at all times. He worked at the relationship with great skill over the five days he was with us, and we had a great time. The guy is a real gem. Our guide, Manuel Usca was absolutely incredible. A totally excellent person and master of the Inca Trail. We camped off the beaten path and felt we had a unique experience compared to other groups. I would recommend him HIGHLY to anyone wanting a once in a lifetime experience. Julio is from an indigenous culture and he added so much to the experience by providing top quality, history, culture and a relaxed tour of the lake area. We even enjoyed a day with his family on one of the Uros islands, including dance, song, food and most importantly the love of his family.